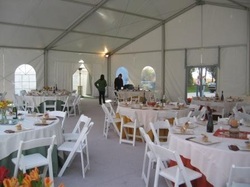 A 50'x115' set up for 250 guests. This event had a floor system with gray carpet. 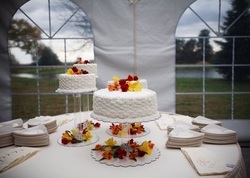 This cake table was in front of the tent windows revealing the beautiful lake view behind. 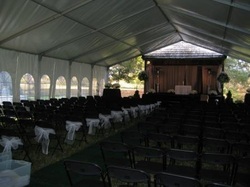 Tent and bandstand in use during the wedding ceremony. 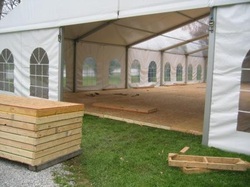 After the tent is up it is time to build the floor system. Each floor section must be leveled and secured. The center wall section is left out to install the optional glass door system. Here you can see the optional glass door system and the heated foyer to the food service area. 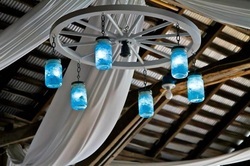 How do you think this ingenious wagon wheel light was designed with no wiring? The clear roof panels enhance the looks of the tent and allow the sunlight to shine in during the day and moonlight at night. 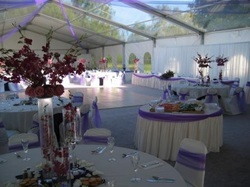 A 20'x24' dance floor is installed in front of the head table. 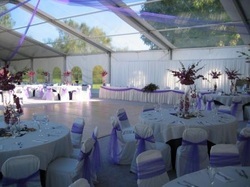 This 40'x80' tent with the end open is placed in front of the existing bandstand. 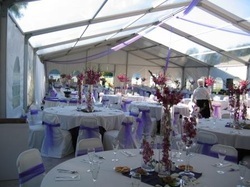 Ever wonder what was involved in designing and building a beautiful wedding tent? 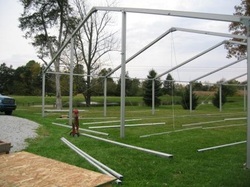 Start with the frame staked in place. And finally after a little work and planning the finished product is ready for an evening of great memories. 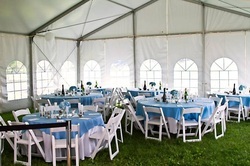 A rustic barn setting can make a beautiful wedding reception. 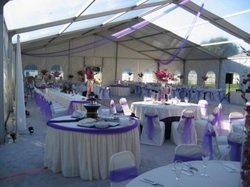 The 30'x30' tent was added to the side of the barn to make room for 60 more guests.